While the grill may be a bit buried in storage this week you might find firing up the oven a good way to warm your home, heart and stomach! 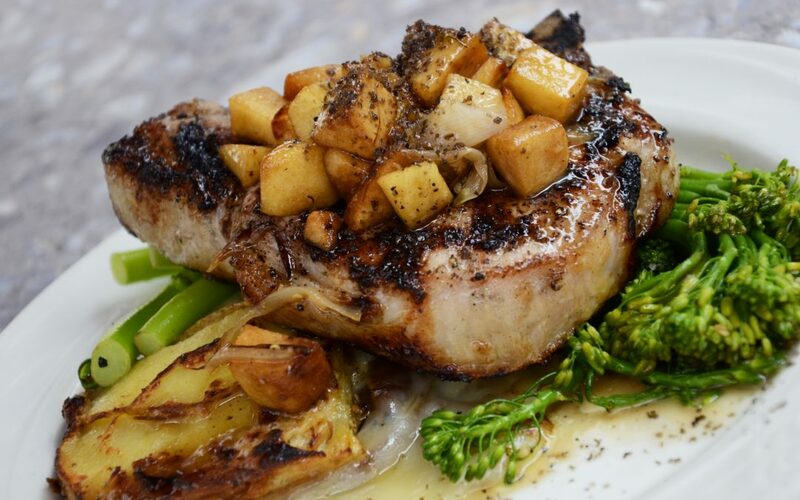 16-24 oz bone-in pork chops whatever with comfortably fit in your pan, Fresh or smoked chops can be used. Season both sides of pork chops with kosher salt and black pepper. Add 2 Tbsp olive oil (or bacon fat) to large heavy bottomed pan (or skillet), and heat over MED-HIGH heat. Add pork chops to pan, leaving at least an inch between the chops to ensure even cooking and browning. Sear 3-5 minutes per side for thin chops add 2-3 minutes per side for thicker cut ones, or until pork chops are mostly done. Chops will continue cooking in the sauce later. Remove pork chops to a plate. Pour in stock mixture, using a wooden spoon to gently scrape the bottom of the pan to release any brown bits (those are full of great flavor). 2. resized proportions for our own larger chops than what the store offers.